Store wine between 12-14 °C (53-57 °F). This allows the wine to be brought quickly to the table - even when the serving temperature of the wine varies and is between 6 °C (42 °F) and 18 °C (64 °F). If the wine is stored at around 25 °C (77 °F) its aroma can change. 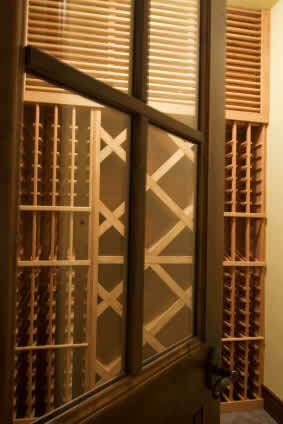 When storing wine for long periods of time the bottles must be stored horizontally so that the corks remain moist. This is not necessary if storing wine for only a short length of time. No light! Light accelerates the oxidation process and the color and taste will change over time. The air humidity should be between 80-85%. As a minimal amount of air always escapes through the cork, the wine evaporates quicker in a dry environment. 8 °C (46 °F) is not suitable for the long-term storage of wine. The temperature fluctuations may be measured with a maximum minimum thermometer. therefore the wine must be stored in a quiet place. Wooden diamond-shaped shelves, such as those shown on the left, are stable and take up little space. Of course other types can also be used depending on your taste and the amount of space you have available. Magnum bottles and other special sizes require their own compartments. A tasting and administration area is also a good thing to have. This would include a washbasin, spittoon, a small bar, wine glass holder and glasses. In addition to this, wine tasting software may also be used for that extra touch of luxury (e.g. ""Open Cellar" or "webnwine").